Spacecraft landing on Jupiter's moon Europa could see the craft sink due to high surface porosity, research by Planetary Science Institute Senior Scientist Robert Nelson shows. Nelson was the lead author of a laboratory study of the photopolarimetric properties of bright particles that explain unusual negative polarization behavior at low phase angles observed for decades in association with atmosphereless bodies including asteroids 44 Nysa, 64 Angelina and the Galilean satellites Io, Europa and Ganymede. These observations are explained by extremely fine-grained particles with void space greater than about 95 percent. Grain sizes would be on the order of the wavelength of light of the observations (a fraction of a micron). This corresponds to material that would be less dense than freshly fallen snow, raising questions about the risk of a Europa lander sinking into the surface of the Jupiter satellite. This work was published in the journal Icarus and is titled "Laboratory simulations of planetary surfaces: Understanding regolith physical properties from remote photopolarimetric observations." Observations were made using a goniometric photopolarimeter of novel design located at Mt. San Antonio College in Walnut, California. The powders used were aluminum oxide (Al2O3), which is an excellent regolith analog for high albedo airless bodies in the solar system, including water ice bodies such as Europa. "Of course, before the landing of the Luna 2 robotic spacecraft in 1959, there was concern that the Moon might be covered in low density dust into which any future astronauts might sink," Nelson said. 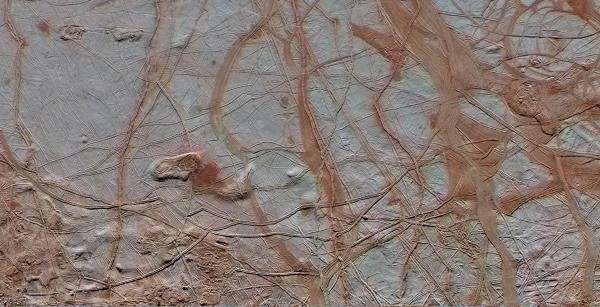 "However, we must keep in mind that remote visible-wavelength observations of objects like Europa are only probing the outermost microns of the surface." This work was partially supported by a contract from the NASA Jet Propulsion Laboratory to PSI in support of the NASA Cassini Saturn Orbiter Visual and Infrared Mapping Spectrometer instrument team.